Blah blah blah. Rhubarb, rhubarb, rhubarb. Don’t worry, I haven’t become Boris Johnson’s speechwriter. But doesn’t it strike you as odd that this leafy, manure loving vegetable-that-thinks-it’s-a-fruit should have become the go-to word for simulating a general hubbub? And furthermore, that a simulated hubbub is not a syllabub, even if it happens to be a rhubarb syllabub? Rhubarb for me is one of the eternal enigmas, like if the Earth is round, why are all maps of the world drawn in landscape format? Didn’t anyone ever think to put one of the poles in the middle and turn the Americas upside-down? After all, polarity isn’t a vertical force, is it? That’s gravity. The enigma of rhubarb is less to do with the direction it grows in as the fact that it doesn’t seem to grow at all. Not in my garden anyway. I have no luck with the stuff, which is why I’m writing about it at a time of year when no-one else is the least bit interested in it. While rhubarb is supposed to be dormant right now, mine is positively comatose and has been for several months. Despite being treated to large quantities of horse droppings, it’s shown as much sign of stirring as a teenager on a Sunday morning. And the aroma is not dissimilar either. Perhaps the hot summer did for it this year. Rhubarb likes cooler temperatures, according to all those annoying websites that go on about how easy it is to grow. In Alaska it grows to five feet tall. In Yorkshire it grows so fast you can hear it. Geoffrey Boycott learnt to bat with it. And the area of West Yorkshire between Wakefield, Morley and Rothwell, known as the Rhubarb Triangle, is so famous Barry Manilow wrote a song about it. It wasn’t a high point in his songwriting career. Originally a folk ballad about winning first prize at the Wakefield Rhubarb Festival, he later changed the lyrics and reset it in Bermuda in an effort to woo the American audience. 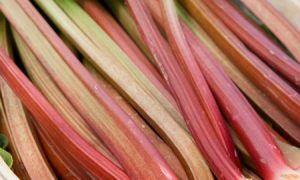 In America, rhubarb has the colloquial meaning of a dust-up, which may have given Manilow the inspiration for his earlier hit, Copa Cabana. This originated in baseball circles in the 1930s without any rhyme or reason but seems to fit the purpose very well, just as it does for simulating a hubbub. The origin of the word rhubarb is similarly nonsensical. The Greeks had a word for it, ‘rha’, which was also their word for the Volga river. It’s possible that they called it such because it was imported from Asia along a route that ran down said river, though that seems a bit simplistic for a people whose idea of unwinding was an evening discussing the elements of man and the internal angles of a triangle. They did, in fact, complicate matters by adding the word ‘barbaron’ (meaning foreign, as in barbarian) to the name. Over the centuries, ‘rha barbaron’ (I’m not making this up) morphed into the French ‘reubarbe’, which you might think was a misspelled translation of ‘beard street’ but was actually a derivation of the Latin ‘rheubarbarum’. The Romans had taken the Greek and shoehorned in a reference to ‘rheum’, the bodily fluid that is secreted from the facial orifices of ill people and was believed to lie at the root of most ailments, eg rheumatism. Rhubarb was believed to help cure rheum-related illnesses, as well as being an effective laxative. It 1066 it was brought over to England in the medical supplies of the Normans, who suspected they might need a little help getting things moving after a few days of the English diet. It was not until the 17th century, when the sugar industry took off, that rhubarb made the transition from bitter medicinal plant to popular and very hard to grow pudding ingredient. But the medicinal reference remains in its biological name: rheum rhabarbarum – literally ‘barbaric snot’. Don’t let that spoil your syllabub.